Everyday Magic is in month 2 of 2, a series of events open to the public based upon the, uh, everyday miracles we love to promote. In art. Or not. 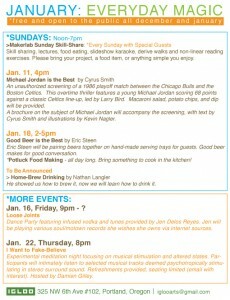 Events this January are pretty much magical! Watching Michael Jordan score 68 points with Cyrus W. Smith, drinking paired beers and watching sci-fi with Eric Steen, dancing to Jen Delos Reyes’ dream mix of soul/motown, having a potluck with Paige Saez in the Igloo kitchen, drinking Nathan Langler’s batch of Igloo Home Brew, and getting intergalactic with altered state audio meditation night. *Concurrently showing is < a href="http://www.garywiseman.com/"Gary Wiseman's installation / performance entitled Where Am i. Please come visit us! Most if not all Makerlab Events and IGLOO Gallery are at the same magical place!